So cool! I hope to get my hands on it sometime soon! Nice sauropod collection by the way! Jealous of your Sinclair brontosaur. We got our copy a couple of weeks ago. I pre-ordered the book for my wife. Her favorite dinosaur is Apatosaurus. I’m looking forward to pick one up at SVP! Received the book as a surprise delivery from amazon on Tuesday. I haven’t had a chance to read much of it yet but I’ve been thumbing through the pictures and diagrams all week – fantastic work all around. Congratulations! I received the book last Wednesday, I also have not read it yet, but I scanned through it, for quite a while. Dr. Wedel, you and Mr. Hallett have made what I think is the BEST sauropod volume you can ask for. Love Hallett’s fantastic artwork , and look forward to reading what you wrote, I have no doubt it will be very informative. You two covered everything someone could ask for in a sauropod book. 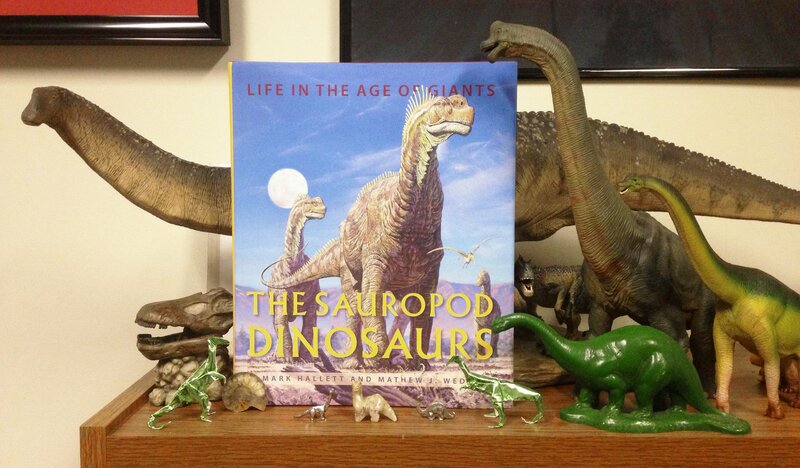 I noticed sauropod paleobiology in the book covers every topic from diet to reproduction. I have two other Sauropod volumes, but you and Mr. Hallett have literally written the Bible of sauropod books. I can not say enough good things about this volume you two have done. Congratulations! Thanks, everyone, for the kind words. I’m glad those of you who have gotten books are enjoying them. Two notes – it’s not just my writing. Mark’s first authorship was entirely earned. The book was his idea, and he did most of the writing. I wrote the first drafts of three or four chapters and he wrote first drafts of the rest, then we swapped and edited each other’s writing, then we swapped back and edited some more, vamp til fade. This turned out to be a huge thing for the book, because Mark knows and cares a lot more about some things than I do, and vice versa, and our separate areas of expertise complemented each other nicely. Also, the Sinclair-esque brontosaur can be had for about two bucks from the Field Museum Mold-a-Rama machines. Details here. Just ordered it. I can’t wait to receive it. So stocked. Hi..My son, 7 years, he love to study Dinosaur story. We live in Thailand. I may purchase this book for him. Panida, the book is really not suitable for a seven-year-old, however advanced. It’s very technical. Sorry. Sadly, Mike is correct. There are a couple of mitigating factors. The first is that the book contains lots of pictures, including skeletal reconstructions and cut-aways showing internal anatomy, which should appeal to readers of all ages, and the second is that today’s seven-year-old is tomorrow’s ten-year-old, and I don’t think the book is beyond the grasp of an ambitious kid of that age. With all of that said, “Dinosaurs: The Most Complete, Up-to-Date Encyclopedia for Dinosaur Lovers of All Ages” by Tom Holtz is definitely a better pick at this age and something your son will be able to grow into. If the book’s got great pics…a given; Mark is one of the greats…then the book very likely will interest a seven year old a lot. I’d have been interested in it when I was five. Understanding might be another thing.